HARTFORD - There's growing concern that Connecticut's economy already has taken a hit from the protracted state budget impasse, which legislators hope they're close to finally ending in the coming days. Connecticut economist Pete Gioia said new labor statistics show the state lost 7,900 during the last three months, the same period as the after-innings budget negotiations. That's meant most of the job gains from earlier in the year have been erased. “I think that this should set off some alarm bells with our policymakers and tell them the economy and job recovery is job one,” he said. Democratic and Republican legislative leaders announced early Tuesday they had reached an agreement on details of a proposed two-year budget. Rank-and-file lawmakers were slated to learn more about the plan later in the day during closed-door meetings. The proposal also needs to be presented to Democratic Gov. Dannel P. Malloy, who has been skeptical about whether he'll be able to sign the deal into law. Connecticut has been without a two-year budget since the fiscal year began July 1. Malloy has been using his limited executive spending authority to run the state. Malloy said he agrees with Gioia that the impasse has taken its toll on the jobless numbers. He said the construction industry has complained that there isn't a bigger pipeline of state-funded projects. 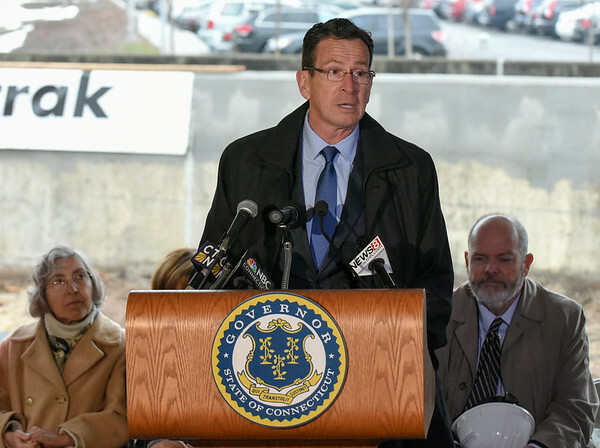 Malloy said Connecticut also hasn't been able to replace large numbers of its workers who've left state service, further adding to the job loss numbers. Don Shubert, president of the Connecticut Construction Industries Association, said his organization has seen a slow-down in projects. He said it's “hard to put a finger on what's causing it,” but acknowledges the state's budget woes could be partly to blame. He notes how the state Department of Transportation scaled back road pavement work earlier in the year when initial state budget proposals were released. Betsy Gara, executive director of the Council of Small Towns, said municipalities, including Plainfield and Prospect, have delayed road projects due to the budget impasse, concerned about when or if the state might release grant funds. “If they've not been bonded to date, they don't have any other choice but to delay,” Gara said. She said municipalities also are hesitant to move forward with construction after one of the major credit rating agencies, Moody's Investors Services, last week identified 26 Connecticut cities and towns, as well as three regional school districts, to be reviewed for possible downgrades because of their reliance on state funds and the uncertainty surrounding the budget. Moody's assigned “negative outlooks” to ratings for 25 additional communities and three regional school districts, blaming the stalemate. Posted in Newington Town Crier, Business, Newington News, State on Tuesday, 24 October 2017 15:09. Updated: Tuesday, 24 October 2017 15:11.